Měi guó Mèng is a translation of “The American Dream” in Mandarin . Here is an example of how this can create opportunity. Opportunity in the Chinese RV? The global economic pivot has accelerated due to the S&P’s downgrading of Americas debt. The USA is not in this pickle alone. The US debt problem is only one of three problems. First, the global economy has a GDP that is estimated to be 62 trillion US dollars in 2010 according to the IMF. The economy of the European Union generated a GDP of over US$16.2 trillion in 2010 Compared to 14.6 trillion for the US, 5.8 trillion for China and 5.4 trillion for Japan. Japan’s economy has been in the doldrums for well over a decade. Europe suffered when the insolvency of several of its small nations, Greece and Ireland especially became apparent. Now Italy and Spain appear to be in trouble as well. Italian and Spanish insolvency are more than just another small European economy being in trouble. Italy and Spain are the third and fourth largest economies in the union. Their problem creates a new era stage in the Euro Financial Crisis. Europe, the US and Japan’s economies represent 36.2 trillion or near 60% of the world Gross Domestic Product. The second problem is that a majority of the population are not in agreement with the way the problems are being handled. A new CBS News/New York Times poll last week revealed that 82% of Americans disapprove of the way Congress is doing its job – the highest disapproval rating since polling began in 1977. Just 14% approve of Congress’ performance. By a ratio of more than two to one, Americans said that creating jobs should be a higher priority than spending cuts. Europeans are rioting over austerity measures and in America Congress simply stalled making the hard decision and passed the responsibility to a commission instead. Such a huge majority of voters are locked into Social Security and Medicare that it will be hard politically for the US to make shifts in these core programs. Third, so many people are afraid that government’s of the world have reacted. Yesterday’s New York Times article said: The European Central Bank signaled on Sunday that it would intervene more aggressively in bond markets to protect Spain and Italy, and leading finance ministers conferred about the mounting threats to the world’s economies, as policy makers sought to calm markets unnerved by deteriorating public finances and slow economic growth. The shock of the downgrade Friday of long-term United States government debt and the worsening situation in Europe added new urgency to the efforts to restore confidence and prevent an extension of the stock market slide that began last week. This is the root of the shift. Western governments have been “taking all necessary measures to support financial stability and growth” for so long that now when the balance has been so thrown out of kilter and bad math has become so distorted that it can no longer hide, the world has to face the fiscal music in an extra tough way. The problem is that governments no longer have any money to take necessary steps to protect markets or create jobs. “All necessary measures” mean “borrow more money”. Western debt is such that these “measures” will be counter productive. Expect these three problems to reduce the purchasing power of Western currencies. We look regularly at five ways to overcome the loss of purchasing power created by the global economic pivot. 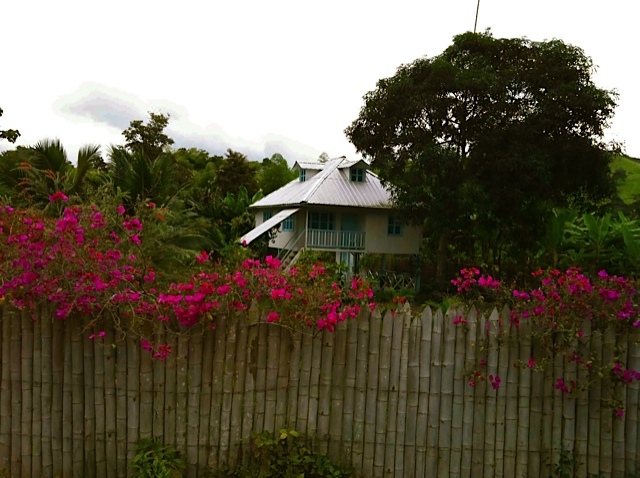 investing in multi currencies, invest in good value real estate, invest in good value equities, live in low cost places and have your own international micro business. Having your own international micro business does not necessarily mean you have to move or be abroad. There are ways to be locally international. Take for example the RV industry. An August 5, 2011 article “Decline of a powerhouse” in a local Oregon newspaper, special.registerguard.com shows how the RV industry has been decimated when it says: It’s a historic bust for Lane County’s RV industry. Navistar International’s decision to move 450 jobs to Indiana from its Monaco RV motor coach plant in Coburg will reduce employment in Lane County’s transportation equipment manufacturing sector by half. That’s terrible news for a local economy that has grown numb from similar blows. Even before Navistar’s announcement Tuesday, employment in the sector, mostly recreational vehicle manufacturing, had fallen 80 percent from its peak in 2005. Lane County’s RV-makers employed 4,600 workers in 2005, according to the Oregon Employment Department, having added more than 1,000 jobs in just two years. Eugene and Springfield had become bedroom communities for Coburg and Junction City, the industry’s leading production points. Then the bottom fell out. A credit crunch, a deep economic downturn and high gas prices all came at once. Here is a distortion created by two trends. 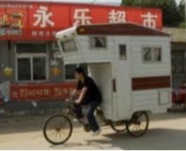 Most people think the RV industry is dead and maybe it is… in the USA, but in China it is just beginning to boom! The Chinese consumer wants Měi guó Mèng… the American Dream. “Holding this rally is to sound the industry’s horn assembly, to gather the RVers, RV lovers, campers dispersed in different regions of China, who are at this moment in little quantity”. Photo of Chinese family in China pursuing the American Dream from article at USA Today. An August 6 USA TODAY article entitled “Road trip: Chinese rev up the RVs” by Calum Macleod says: Loading up the Winnebago and seeing the country via its highways, byways, campgrounds and tourists traps is a classic American summertime pursuit. And now it’s come to China. Chinese tourists check out the recreational vehicles on display at the RV rally held in Fangshan, a suburb of Beijing. On Thursday, they drove their Chinese-made Zhongtian recreational vehicle, bought recently for $93,000, to join hundreds of other RVing fans at a campsite rally in Fangshan, a southwestern district of China’s capital. The Lius want to go well beyond a cross-China excursion: They hope one day to drive to Europe and eventually travel coast-to-coast across the USA. After more than three decades of dramatic economic growth, China’s better-off citizens are busy testing new lifestyles and leisure pursuits, from horse riding and skiing to golf and overseas travel. RV camping is another recent trend here, promoted by entrepreneurs and a central government keen to boost domestic tourism and consumer spending. 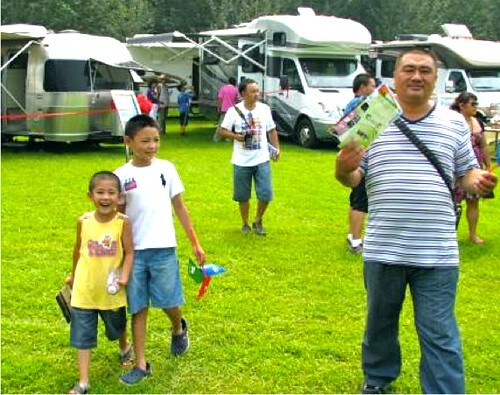 In a nation of 1.3 billion people, where car ownership remains a dream for most Chinese, RV owners number 5,000, with just a few dozen RV camps, according to the China RV & Camping Association. Approximately 8.9 million households own an RV in the USA, according to the Recreation Vehicle Industry Association, and there are thousands of RV camps in the country. Change is coming fast in China, says Wang Jidong, the RV association’s secretary general, as local governments and businesses build hundreds of RV camps nationwide. Americans still can’t grasp the fast pace of development in China, says Lu Jun, 41, general manager of the Beijing International Automotive Camping Park, which opens later this month in south Beijing. “When I talk to U.S. RV suppliers, they ask if I want to buy three or four vehicles,” says Lu of imported RVs costing over $70,000 each. His reply? “I want to buy 1,000” to fill the 100 camps his company will build within two years. Do you see the distortion? The US has the supply capability and the branding benefit. China has growing demand. There are many ways to be involved, but this message is not to suggest that you invest in RVs. Our core message is always “Do what you love and start from what you know”. The point of this thinking is the global economic pivot is creating many distortions. Look for distortions in a sector or industry you love and know. Invest or create a business in it! In this case, we in the Western world all know “The American Dream”. Take an an area of business or investing that interests you. Relate it to The American Dream. Look for aspects of this business that are suffering in the West that may be on the rise in the emerging world. This review may create a perfect investing or business opportunity for you. Change is always with us and always has been. The pace of change happens to be accelerated now. Most will see this with fear. Yet this accelerated change will created amazing riches for those who embrace the shifts and spot trends that create distortions and contrasts. Here are ways we are helping readers overcome the lost of purchasing power. #1: Live and earn in a lower cost environment: See new idea on how to earn with Ecuador agriculture and exports . Start your won Micro Business. We have started a program to help our readers create their own micro business working with these businesses as introducers, dealers and distributors. We have been writing for years about numerous products that we use and love. Now we have started programs so readers can work with and earn globally with these unique global businesses tied together with our communication system that can bring all this: training…. communicating and networking. #1: Jyske Global Asset Management (JGAM) for those interested in multi currency investing. #2: Bio Wash for those interested in eliminating a toxic environment. #3: Candace Newman Essential Oils for those interested in natural health. #4: Fresh cut Ecuador Roses for those who love flowers and decorating. #5: Ecuador Imbabura Export Products for those who love to travel and want to help the poor. Our October 7-8-9 International Business and Investing Seminar will feature initial training for these programs. Enrollment for our October 7-9 North Carolina Course click here for details.